Choosing a Generator: Which Size is Right? Permanently mounted stand-by generators provide automatic power when the regular power supply is interrupted. Powered by gasoline or diesel fuel, they can power selected circuits within a few minutes of a power failure. Depending on their wattage output, generators will run anything from a small lamp to a number of large appliances. To determine the size generator you will need to total the wattage of the maximum number of items you will be running simultaneously. For items with start up ratings higher than their run ratings, use the higher rating to determine your power requirements. Inductive load appliances and tools such as refrigerators, washers, and power tools require additional wattage for starting the equipment. The initial load only lasts for a few seconds on startup but is very important when calculating your total wattage. For example: running a 100 watt light bulb, a 200 watt slow cooker, a 1,200 watt refrigerator with a startup wattage of 2,900 watts and a 750 watt TV would require 3,950 watts. Use the chart below to find the right generator for you. Be sure to read detailed Safety Tips following the chart. *Wattage listed per item is an estimate; check your appliances for exact usage, or contact an electrician or a heating and air-conditioning professional for exact specifications of each item. For your protection and the protection of Howell-Oregon Electric Cooperative linemen or any utility service crewmen against electrical shock or electrocution, call Howell-Oregon Electric Cooperative Customer Service and ask about a generator transfer switch. Installing a generator transfer switch at your meter base will assure safety against dangerous electrical backfeeding onto electrical lines during a power outage. Never exceed the rated capacity of a generator. Always start the largest electric appliance first, then plug in other items, one at a time. 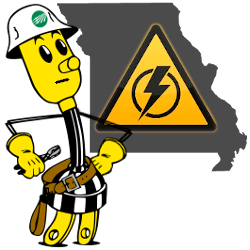 Grounding the generator is recommended to help prevent accidental electrical shock. Choose the appropriate extension cord for the tool or appliance. Larger gauge, three-wire/three prong cords should be used when using an appliance or tool at a considerable distance from the generator. Keep the generator dry and do not use in rain or wet conditions. To protect from moisture, operate it on a dry surface under an open, canopy-like structure. Dry your hands if wet before touching the generator. NEVER try to power the house wiring by plugging the generator into a wall outlet, a practice known as “backfeeding.” This is an extremely dangerous practice that presents an electrocution risk to utility workers and neighbors served by the same utility transformer. It also bypasses some of the built-in household circuit protection devices. For power outages, permanently installed stationary generators are better suited for providing backup power to the home. Even a properly connected portable generator can become overloaded. This may result in overheating or stressing the generator components, possibly leading to a generator failure. The contents of this page (including the Chart) are available for download below.